When It Comes to the Spacewalk, Size Matters This weekend, Sunita Williams is set to become one of the few women to ever walk in space. That's because NASA's million-dollar spacesuits only come in medium, large, and most recently, extra-large. Astronaut Heidemarie Stefanyshyn-Piper releases restraints on the station's new solar arrays during a September 2006 spacewalk. Amanda Young has dedicated her entire career to preserving the space suits from the Apollo-era missions to the moon. The suits, corroding and brittle, are kept in special climate-controlled rooms. Some are filthy, but they can't be washed. After all, some of that gray crud is precious moon dust. Scroll down for that story. Against the blackness of space, mission specialist Peter J.K. Wisoff stands on the end of a robot arm. If all goes as planned, astronaut Sunita Williams will join a small and select group Saturday afternoon. When she opens a hatch on the international space station and steps outside into the vacuum of space, she will become one of the few women ever to do a spacewalk. 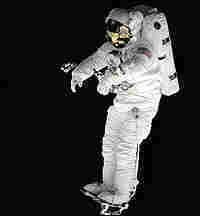 "Everybody would love to do a spacewalk. It's probably the most beautiful view of the Earth," Williams said a few months ago, as the reality of her upcoming walk started to sink in. "But as it's dawned on me pretty recently, it's real serious business." Spacewalking is dangerous, and at NASA, it gets serious respect. The first American woman to walk in space was Kathryn Sullivan in 1984. 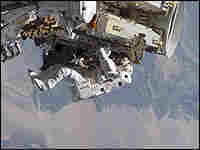 Sullivan says that being an astronaut is an amazing experience in general, but that spacewalking is something special. "Slipping outside a spacecraft in your own little body-shaped spacesuit, it is a neat thing to get to do," Sullivan says. "It is one of the kind of cool, coveted things to do." But even though more than 150 male astronauts have spacewalked, only seven women have gone outside. Partly it's because NASA didn't send women into space until 1983. But veteran spacewalker Mike Fincke says there's another reason. "Our spacesuits only come in medium, large and extra-large," Fincke explains. "Anybody who is on the smaller side … they will not be able to have a chance to go outside." The limitation imposed by small spacesuits was confirmed by Steve Doering, manager of NASA's spacewalking office at Johnson Space Center in Houston. He says the agency last looked into the issue in 2003, and at that point, none of the male astronauts were limited by suit size. But about one-third of the women -- eight out of 25 female astronauts -- couldn't fit into existing suits. 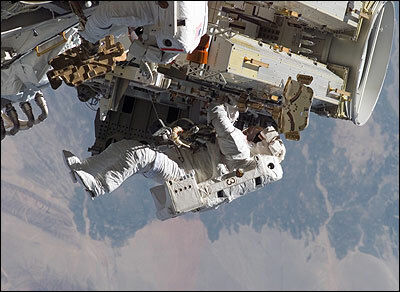 Sunita Williams says the astronaut corps realizes that it's "stuck" with the sizes NASA has. But why is NASA, a $16 billion-a-year agency, stuck with only medium, large and extra-large? First of all, a spacesuit is not like a sweatshirt for sale at the mall. A spacesuit costs millions of dollars to design and build. Lara Kearney, who develops suits for NASA, says a suit is like a tiny spaceship. "It's not as big and as glorious and as wonderful as rockets that shoot fire and things like that," Kearney says. "But it literally is a small vehicle." And these tiny spaceships have to fit right. For example, the arms and legs are inflated with air. So it's hard to bend your elbows and knees unless built-in joints line up properly . And if you're too small for the suit, in zero gravity, you'll float around inside. 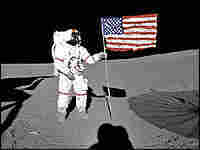 The Apollo astronauts had custom-fitted suits. But in the 1970s, the vision for the space shuttle was that hundreds of people would go into space. Building custom suits for every one would take too long and be too expensive. So NASA built a flexible spacesuit system of mix-and-match parts: arms, legs, torso. It came in four sizes: small, medium, large and extra large. In the early 1990s, a technical glitch forced NASA to develop a new suit. And spacewalking official Steve Doering says that just then, the agency was hit with budget cuts. "One of the things that was eliminated as a result of this cost-cutting exercise was the small and the extra large size," Doering says. The remaining medium and large suits fit most people. But not astronauts like Nancy Currie, who is 5 feet tall. "People my size are in fourth grade. Literally," Currie says. "I mean, some fourth graders are bigger than me." Eventually, NASA did build an extra-large suit. And it started on a small suit, too; Currie worked on a prototype. But more budget cuts came, and NASA killed the small suit. Women's groups cried foul, and NASA's equal-opportunity officer looked into the matter. Lara Kearney worked on the small suit and says that its cancellation is a sensitive subject. "It's very easy to turn it into a gender issue because the small people tend to be women," she says. But she doesn't see it that way. "It is truly, in my opinion, not about gender," she says. To her, it's logistics and cost-effectiveness. For example, unlike larger sizes, the small suit had certain unique parts that didn't mix and match. So if part of a small suit broke in space, the astronauts couldn't easily replace it. And astronaut Nancy Currie says there's another issue. Even if a small astronaut had a suit that fit, it could still be hard to work outside the space station, which was designed when only larger people were suited up. So, for instance, hand-holds spaced far apart would present a challenge for a small astronaut. The question NASA essentially faced, says Currie, is: "Do we spend around $15 million to accommodate, relatively speaking, a few more people than we could today? Or, do we take that money, and turn it towards the suit development for the next generation?" The space shuttle and its suits are expected to be retired in 2010. NASA will need all new equipment to return to the moon and go on to Mars. Glenn Lutz heads a NASA office that is making plans for moonwalks. His team is making a long wish list for the ideal new suit. For example, the suit should be lightweight, rugged and fit basically everyone. "But eventually, we will come to the point in the program when we will need to make a cost vs. capability trade," notes Lutz. Down the road, technical or money constraints may squeeze the size range. One former astronaut who hopes that history won't repeat itself is Bonnie Dunbar. "I do not want to turn to a young girl who has all the talent in the world, becomes an extraordinary engineer, but isn't the right size, to tell her, 'I'm sorry but our nation can't build a suit for you,'" Dunbar says. "It's not the biggest expenditure. And it's not an engineering challenge that can't be overcome." NASA officials point out that not every astronaut has to spacewalk and there are many other important jobs. During a shuttle mission this summer, for example, two men went spacewalking while two female astronauts stayed inside and operated a robotic arm. When asked if the two women could fit in a spacewalking suit, a NASA spokesperson replied that they are "both on the very edge of possibility" in the suits -- so they focused on robotics. 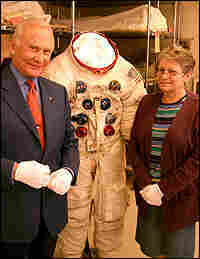 Buzz Aldrin (left) and National Air and Space Museum specialist Amanda Young stand with the Apollo 11 spacesuit that Aldrin wore on the moon, at the museum’s preservation facilities in Suitland, Md. 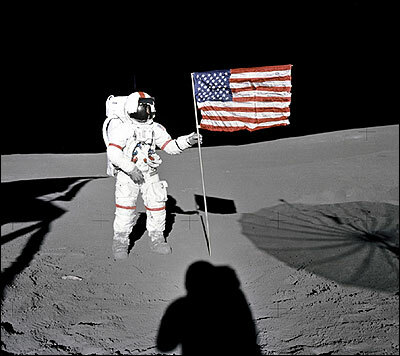 Astronaut Alan Shepard Jr., Apollo 14 commander, plants the U.S. flag during an Apollo 14 moonwalk in February 1971. 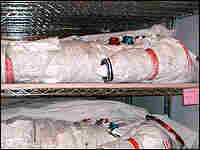 The mission commander spacesuits worn on the moon by Alan Shepard during Apollo 14 (top) and John Young during Apollo 16, are kept in light- and climate-controlled storage at the National Air and Space Museum's preservation facilities. 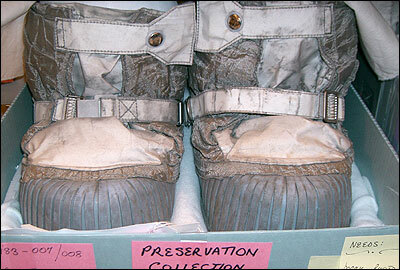 The boots worn by geologist Harrison Schmitt on the lunar surface during Apollo 17. Taking care of old spacesuits is no simple matter. For example, some of them are filthy -- but a curator can't just wash them off. After all, the grey crud might be precious moon dust. "I have to leave the lunar dirt right where it is, because that's historic dirt," says Amanda Young, a curator at the Smithsonian's National Air and Space Museum in Washington, D.C. "The ones that are covered with lunar dirt are so beautiful that you wouldn't want to clean them anyway. It's part of their history. It's what they are." Young has made it her life's work to preserve the nation's historic Apollo-era spacesuits, especially the twelve suits that astronauts wore as they walked on the moon during the late 1960s and early 1970s. Even though Young loves moon dust, she abhors other things that can hurt spacesuits -- like the thought of people handling them. "We try not to touch them too much, because handling is very hard on a space suit, particularly the early ones," says Young. "I always say that the only people who are allowed to touch these suits, other than myself, are the president, because he outranks me, and the astronaut himself. Because I figure they wore them, and they can touch." The Smithsonian's collection includes more than 100 suits from the Apollo era. These include backup suits, training suits and suits built during research and development. 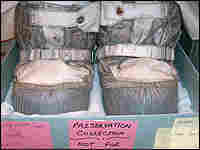 Most are held at a storage and restoration facility in Maryland. Some are in better condition than others. 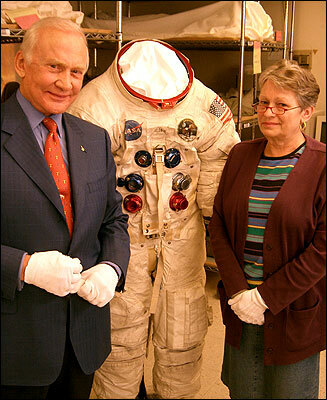 The Apollo 11 suits worn by Buzz Aldrin and Neil Armstrong "are very fragile," Young says. 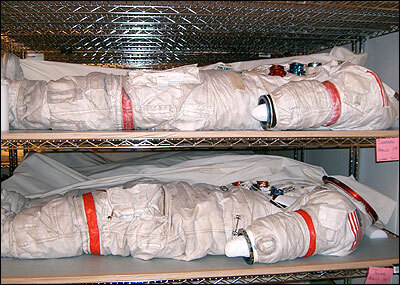 After the astronauts returned to Earth, the suits went on a tour around the world, and suffered a lot of handling. "That was a long time before me," she says. The early suits also are delicate because their interior linings, or bladders, are made of rubber that's breaking down. "The rubber bladders have become very crisp, very hard, and they shatter if you squeeze them," says Young. "I have suits, you know, the bladder in the inside has just crumbled into pieces. You can't reverse the tide of the breakage and the deterioration." On some suits, the aluminum rings at the wrist and neck are showing corrosion. On others, the PVC pipes used as life-support hoses are starting to degrade. Young's team tries to slow the deterioration by keeping the suits in a room that's always about 60 degrees Fahrenheit. The humidity level is kept at about 35 percent. "Keeping them dry is very important," she says, because fungus can grow on the suits, which are laid out flat for storage on racks that are covered with unbleached muslin. Young has been working on preserving the suits for more than a decade. "There's no school you can go to, to learn about space suits. I just fell into it. I was very lucky," she says, adding that she's learned to truly admire two groups of people: "The guys who built these suits, and the guys who wore them."